In many ways this disc can be seen as an archetype for CPO's 'house style'. Forgotten 'Romantic' music - usually of Germanic/North European origin played by good - again Germanic - orchestras directed by relatively unfamiliar conductors. All credit to the label, then, how often this formula proves to be extremely successful, bringing to light music of considerable merit, played and interpreted with skill and insight. CPO's engineering and production is rarely anything but very good, too, with their only Achilles heel a curious preference for liner notes of convoluted verbosity and opaqueness. All of those characteristics are on show here. This is the second Hausegger disc on CPO - the first was dedicated to his sprawling but impressive Natursymphonie, which was given an SACD recording back in 2008. This new disc is in standard CD format only, but the sound is very fine. In his lifetime Hausegger gained greatest fame as a conductor - indeed you can download his 1938 recording of Bruckner 9 - the first to use the 'original' score and not a bowdlerised one. Much as with other conductor/composers - Weingartner and Furtwängler - Hausegger's musical style is backward-looking to some kind of high-Romantic ideal around the turn of the 19th & 20th centuries. From his experience as a conductor his understanding and appreciation of the potential of a large modern symphony orchestra is clear in his confident handling of large forces over extended timeframes. I have listened to this disc - and the Natursymphonie - several times and I must admit my reaction to both discs is pretty much the same. For all the skill in the writing and performing there is something that stubbornly fails to engage me. In comparison to say Josef Suk, who shares very similar dates - 1874-1935 - and writes in a similarly effusive and large-boned style - Hausegger lacks the spark of genius, which technique and training alone cannot transcend. Admirers of his work will be delighted to have this disc, as it contains three of his most substantial scores. First up is the biggest of the three; Aufklänge - a set of symphonic variations on a simple child's song, "sleep, little child, sleep" which runs to over half an hour in length. The quality of this new disc is evident from the very opening bars - beautifully hushed and gently rapturous playing from the Bamberg Symphony warmly caught by the CPO engineers. Indeed the delicate introduction of this lullaby as the theme is one of the most affecting and charming passages in the whole score and disc. As the work builds the theme is ever more dissected and altered so before long the sense that this is a variation work has been lost and instead it becomes a stream of musical consciousness. Around the 8:00 mark there is a nocturnal scherzo, which is strikingly effective, helped in no small degree by the neatness of the Bambergers’ playing. Trawling through Eckhardt van den Hoogen's all but indigestible liner, he suggests that there is an autobiographical element to the work with Hausegger looking back to a simpler, more naïvely idealised time since "a nightmare loomed on the horizon". In the midst of World War I how Hausegger could be quite so prescient - I assume the writer means the rise of National Socialism - I simply do not know. Other writers in reference to the Natursymphonie have heard in Hausegger a Mahlerian grandeur. Certainly, all three works aspire to big serious statements of almost philosophical intent. None of these scores are content to be music for music's sake and I think the greatest 'problem' is that few, if any, composers have managed to fuse music and philosophy without a handbook to explain their intentions. Strauss famously attempted capturing the essence of Nietzsche in his Also Sprach Zarathustra and Hausegger tries much the same - coincidentally(?) producing the most overtly Straussian of the three scores here in his Dionysische Phantasie. Given the date of its composition - 1899 - just three years after the Strauss, that should not be wholly surprising, especially given that the composer was just 26 at the time. Indeed, by that measure this is a very accomplished and confident score, lacking just the last jot of melodic memorability to go alongside his assured handling of the orchestra. There is a drive and ardent energy in this music that is hard not to be swept away by - indeed it often teeters on the edge of melodrama. Again I have nothing but praise for the performers here, who really do play the music with all the attack and conviction it demands and requires. 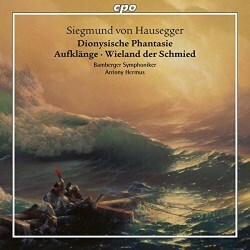 Quite early on, CPO recorded a substantial amount of music by Richard Wagner's son Siegfried. He again shares similar dates (1869-1930) and I must admit that several times I found myself comparing this music to Wagner fils. Siegfried - not surprisingly perhaps - produced a substantial body of work for the operatic stage, but his Symphonic poems and Symphony exhibit similar traits to Hausegger - indeed his Sehnsucht of 1895 shares striking similarities, both in mood and melodic line. I wonder if Hausegger knew the work, when he turned to write his own score. If I am being quite harsh I would say the weakness of both scores is that the emotion is generalised so that extended passages are full of stormy complex writing, which is effective in a wider sense, but I find I'm longing for a moment of simple clarity - something profound not prolix. I have exactly the same issues with Josef Holbrooke's tone poems; big on gesture and light on individuality or insight. Much the same can be said of the third and final score Wieland der Schmied from 1904. The opening is again of cinematic drama, but the emotion it evokes could as much be a dark and stormy night as a shipwreck or doomed lover. And that really is the seat of my problem with this music. I can recognise in a generalised way what I think the composer means, but it does not then draw me into something more personal and thereby moving. Wieland again features pages of minor-key drama - a beautifully played violin solo along the way - that lack for me a specificity that allows me as a listener to identify with the musical narrative and be drawn into it. In all three works the most impressive passages are where Hausegger strips back his orchestral canvas and writes on a more intimate scale. When he does that, his skill as an orchestral composer is apparent. The closing pages with heroic brass and glittering percussion is about as cinematic - not really in a good way - as a score from 1904 could be. All that being said, I am eternally grateful that CPO continue to produce discs of such high quality - and despite my evident reservations I suspect I will be queuing up to hear the next release, which is due to include the main missing work now - Barbarossa. I did think CPO had moved on from the glutinous liner notes, translated with a painfully literal style, but sadly this one is a major return to those bad old days. Perhaps it makes for more enjoyable reading in the German original, but the English translation is about as off-putting as it could be. For those new to the byways of German Romanticism, there are finer composers to discover before Hausegger, for the already converted this is as impressive a disc as could be hoped.